[In the below report William Brandon Shanley details an exchange he had with an unnamed reporter who refuses to look at the case of official U.S. government complicity in the crimes of 9/11. 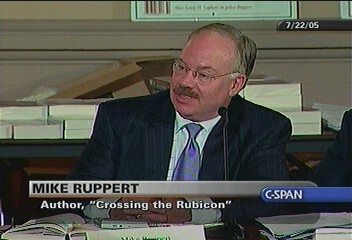 Even though this reporter was sent excerpts of "Crossing the Rubicon" he never once addresses the case made by Mike Ruppert. Instead the exchange focuses entirely on physical evidence. There is a big lesson to be learned here for those who have the eyes to see it. In the Spring of 2002, I began assaulting my friends and acquaintances in the mass media with LAPD narcotics officer turned “info-cop” Mike Ruppert’s powerful essay, "Oh Lucy! - You Gotta Lotta 'Splainin’ To Do”: A Timeline Surrounding September 11th - If CIA and the Government Weren’t Involved in the September 11 Attacks What Were They Doing? Mike’s eye-popping, prodigious assemblage of published facts blasted white lightning through my axon pathways and put down whole new constellations of dendrites when brain synapses rewired through enlightening insight. I would never be the same. His was one of the first compilations of information pointing to evil acts by criminal elements of our government I encountered, so I spread it wide and far: Judy Woodruff. Helen Thomas. Sam Donaldson. Marty Schram. CNN Headline News chief, Teya Ryan. Aaron Brown. And, many, many others. Funny, nary a peep. So confident was Mike in his research he offered to pay anyone $1,000 to prove any item on his long list wrong. As far as I know, in all these years, he’s only had to pay out once. That’s a record neither the New York Times or the Washington Post or CBS News can match. Or any news organization that I know of. Do you? Between 2002 and today, a plethora of new evidence pointing to a criminal conspiracy by elements of our government has been thoroughly and impeccably assembled by the likes of many fine people, including David Ray Griffin, Steven E. Jones, Webster Tarpley, and many, many Great Americans in the 9/11 Truth Movement. And let’s not leave out the amazing Loose Change team, Dylan Avery, Korey Rowe, and Jason Bermas, or cyber-journalist Alex Jones. Recently, I was drawn into dialogues with an independent reporter and a media critic about what I call “the anomalies of 9/11.” In the course of the dialogues I sent them a summary of Mike’s book, Crossing The Rubiconand Steven E. Jones’ exhaustive research and analysis of the structural integrity of the towers as just two structural pillars constituting our new Towers of 9/11 Truth. Why are reporters like you refusing to report on the 9/11 "anomalies," possible criminal acts by our government, the suppression of evidence, and the motherlode of research which now shows the government's conspiracy theory can't hold a drop of water? This reticence would seem to fly in the face of everything reporters say they stand for: the Truth. Why has journalism forgotten its role? Why aren't the media watchdogs taking this on? What's the fear? Is the same thing happening to you guys that happened to the MSM? It's interesting to note the spin the Washington Post put on the fact that the FBI has long declared that prosecutors have insufficient evidence to indict bin Laden for 9/11 which explains why he is not wanted for 9/11 crimes and on the FBI's 10 Most Wanted poster. The spin: No Big Deal! I disagree with the "inside job" theory. In fact, I consider some of it a disinformation campaign on par with the nonsense about Clinton murdering Vince Foster. If and when there is real evidence -- not speculation, but evidence -- then it might be worth devoting more time. But so far, I have seen no credible evidence that Bush pre-wired the Twin Towers with explosives or that there was no plane crashing into the Pentagon or, if there was a plane, that it was guided by remote control. Just because some people hate Bush is no excuse to accuse him and others of murdering 3,000 people based on the wildest of speculation. In fact, I consider much of this shameless. Why are reporters even refusing to write about the movement? Bill, There's no evidence. NONE. There's speculation and opinion, but no evidence. There's plenty of evidence to overthrow the government's theory, but you won't discuss the list of Ruppert's points I sent to you. Didn't I send you summary of the findings of his book, Crossing the Rubicon? If not, I'll paste them below. By contrast in the JFK case, there was significant evidence of a conspiracy: the Zapruder film showing Kennedy's head snapping backwards, the Dictabelt timing of the shots, Connolly's testimony on when he was wounded, eyewitnesses who say the shots came from the front, Oswald's saying he was a patsy, etc. Granted, the government could offer contrary arguments to knock down some of this evidence, but it was evidence. It took years for those pieces to come out and even now the establishment media refuses to address them. Just like events today with 9/11. But it's not evidence for someone to say he thinks the building should have fallen down differently, or that he doesn't think it was hot enough for steel to melt, or that he doesn't think the pilot at the Pentagon could make the turn, etc. That's just opinion and speculation. That's simply not true. There is scientific evidence on the collapse. Have you looked at Professor Steven E. Jones' evidence? The government's theory defies physics: both laws of falling objects and temperatures at which steel melts, not to mention 70 stories away from the fire burning for less than two hours. Have you seen the testimony of the aircraft rental company pilot that checked out the 9/11 Pentagon pilot on the Cessna? Why were no jet engines found at the Pentagon? Or why was debris from flight 93 found 8 miles from the "crash" site, again with no engines. These are legitimate questions and there is a huge body of evidence that punctures the government's theory. If you are not familiar with it, you haven't been interested enough to look. It's like the stories about the Clinton "murders." There was a lot of conjecture but no evidence. Ultimately, it turned out to be a disinformation campaign, which is where I would put this one, except that the target is Bush instead of Clinton. Oh, Alan that's nonsense. That's comparing apples to the QE II. Address the litany of evidence that's been presented by the 9/11 scholars and the truth movement. Ruling it out of hand just doesn't wash.
Plus, I don't think for a second that the FBI is balking at accusing bin Laden of a role in 9/11 because they don't think there's enough evidence. My goodness, the guy's confessed and so has Zawahiri. Well, my experience shows me the government runs to indict hamburgers before grand juries all the time. It only took them three months to indict bin Laden for the bombings in Kenya and Tanzania. Why not 9-11? The conclusion led to us invading a nation! The December 15th bin Laden tape is an obvious fake. Anybody can tell that's not bin Laden. He's too fat, is wearing ring and is using the wrong hand. And the voice prints don't match. As far as government translations of Zawahiri, I don't believe what our government says. I saw too much fake news being written at CNN, and see too much of it everyday on the air and in the papers from so-called "official sources." Do you think the FBI is standing up to Bush on this? No way. So, to answer your question: Without evidence of a Bush conspiracy, there really isn't much for journalists to work with. Plus, there is a cult-like quality to this group. They are nastier in their comments than any of the right-wingers who send me e-mails. Take on the evidence being presented by the credible people involved here. Write about that and refute it with your facts and analysis. That's certainly worth a whole series of articles and will get you lots of readers and maybe some cash to fill your coffers. I'm personally starving for evidence to refute the evidence and arguments presented by the 9/11 scholars, former government officials, military, pilots and others in the 9/11 movement. But no one presents any. They just accept the government's theory and rule everything that undermines that as being impossible or unfair play or disinformation. Continuing to believe the government's theory by saying the government's theory makes the evidence that's being presented by these folks impossible, won't work any longer, Alan. That's like a scientist saying "because our physics demands that the observer has no effect on the outcome of an experiment, any evidence to the contrary cannot exist, and therefore what you are seeing is not evidence, cannot be happening and your theories unfairly undermine the efficacy and credibility of our noble leaders." Come on, Alan! Can't you see what's happening here? You don't seem to get my point. There is no evidence. Plus, the overall concept is madness. I understand there is a cult-like movement building up around this and you have every right to join it. But I am a journalist, not a philosopher or a conspiracist. A person's opinion, contradicted by a lot of other people's opinions, is not evidence. I don't have enough time to waste on every crackpot theory that is tossed out. Our entire world view is made of theories. Theories, maps, metaphors are all we have at our disposal or describing "what is." What is fact, what is evidence, is determined by the theory we are using to find facts. Please let me know your reaction on points, not through sweeping unsubstantiated disqualification. Also, are you familiar with Day Ray Griffin's books? William, Yes, and I think they are nonsense. "I'm saying they're absolutely guilty of murder of more than 3000 people. This is not a question of holding the door open, walking away and letting it happen. This is a question of actively controlling the attack." I'll gladly continue our discussion. You have never provided me with anything remotely close to evidence to back up this assertion, nor have I been able to find any such evidence. If you ever do, please provide it to me and I'll get back to you. If you're looking for a "smoking gun," you're being too myopic and in denial about who these people really are. Much has been destroyed or is being kept from the public under the "national security" label and from past experience we know virtually everything Bush and Cheney say in areas of national security is a lie. These people are too smart to leave anything like a direct causal link or physical evidence in plain sight. And the media are being disingenuous to require it. But from the new physics we learn about correlations, coherence and causal weaves which posit guilt just as reliably as physical evidence and linear cause and effect. We are able to see very distinct correlations between what's missing, what's hidden, what's been destroyed, what's been altered, who's been excluded, who was tipped off, who profited, who was protected, who was sent away, who blocked information, who moved where and when, how events unfolded, how the investigation was controlled, who had the resources, who controlled them, how they were managed, who has misspoken, what news was misreported or re-ported, what was unavailable, who controlled the view, who was sworn to secrecy, and what government reports have been, or are being changed, and in what areas. We also see the refusal by the war profiteering mediaplex to take on substantive anomalies in these precise areas or to even admit the presence of the elephant in the room. When these correlations of what’s missing and the behaviors are coupled with the huge body of 9/11 truth movement research and organized into constellations, this highly complex “map” reveals the Bush-Cheney-Rumsfeld-Rice-Powell entity at the intersections in bold and high relief, not some Islamic freedom fighters with big bank account, a cell phone, a TV, and machine guns sitting in a cave thousands of miles away from the action. This metaview is the evidence. When a child is found smashed in an otherwise empty street with a tire track on its back, it's not difficult to surmise that it was crushed not by a meteor but by a vehicle. Moreover, we see in the 2000 & 2004 election frauds, 9/11, Iraq and Katrinapatterns of coherence in the meanings. Coherence in behavior and actions, inactions, control, lack of control, chains of command across agencies, war games/rehearsals, a long list of well documented instances of deception and lying as SOP, as well a recurring historical record of sending resources away from impending crises, and/or failing to provide them. The coherence of these meanings implies goals or objectives to engender chaos, create destruction, foment violence, or go to war to gain, retain or expand the power of the oligarchy. When you have dead people lying all around with bullets in them, and one person standing, and the only man in the state who can afford a gun is also a known liar and war profiteer, who needs a smoking gun to know the truth? When lightning strikes, what additional evidence do you need that it was created by the thunderstorm happening all around you? These are the ways to evolve a meaning of just what level of perfidy and evil has overtaken our government and the corporate owners of the mass media, not by demanding some silly “smoking gun.” That’s being deliberately myopic with a purpose. Who needs to see physical evidence or a direct causal link to prove Hitler committed the crimes of the Holocaust? Surely, there would be no physical evidence of such crimes! Does this mean 9/11 Truth Movement deniers are on par with Holocaust deniers? My vote is “yes.” And yours? Thought systems, worldviews, meaning, coherence, acausality, synchronicity, intuition, quantum correlations -- these are some of the new tools in our laboratory that are necessary to interpret behavior, and cause and effects in human affairs. Oily-Banking-Media-Military-Industrial-Think Tanking-National Security State Spying-Liberty Eviserating-War & Prison for Profit-Complex n’ Psycopathic, Incs. So we see the correlations, the coherence, the grand choreography of meaning all swirling around an enormous vortex sucking time and space. In the universe, we call this a black hole. And what is the evidence of its existence? The answer is its invisibility and the behavior of everything feeding it and spinning around it. And that’s all we’re asking for! I will prepare an essay on the same soon. I'd make it a book but there isn't time. What is the evidence to support the government's conspiracy theory? I’m now awaiting replies. And no, I won’t hold my breath. Mike Ruppert, who in my mind, defines the appellation “American Hero,” has now fled the United States for reasons he details in his essay, By the Light of the Burning Bridge: A Permanent Goodbye to the United States. And I’ll leave you with this question: if Mike hadn’t struck awfully close to home with his evidence and theories, why would anyone bother penetrating his organization, smash his computers and drive him from the country? His exile correlates with the rest of it, now doesn’t it? And there comes a time when one must take a position that is neither safe, nor politic, nor popular, but one must take it becauseone's conscience tells one that it is right." William Brandon Shanley has worked extensively in the media industry, including stints as a writer for CNN and as an independent producer of documentaries. He interviewed Presidents Reagan and Carter in preparation for his documentary called The Made for TV Elections with Martin Sheen and worked for President Carter. He also edited and contributed to Lewis Carroll’s Lost Quantum Diaries. * The opinions in this article are not necessarily or entirely those of From The Wilderness Publications.